This product was provided to me by Nintendo. Opinions are my own. It's the game hated by the masses as early as its first reveal trailer, and now it's here to make those conclusion jumpers eat their words. Well, partially at least. Color Splash is indeed reminiscent of Sticker Star in many ways, but it improves on the Sticker Star formula almost everywhere. It ought to go without saying (but clearly it doesn't) that one's enjoyment of Paper Mario: Color Splash is likely to come down to personal taste. Therefore, as you should with every game review, you should be reading this review to understand what the game is like in order to make your own prediction about whether you'll like it based on your tastes in games. Our story begins with Mario and Princess Peach receiving a letter which actually turns out to be a paper Toad, cruelly folded up into an envelope and drained of its color. With their detective-like deduction skills (of checking the postmark), Mario and Peach head off to Port Prisma to investigate, only to find the town vacant and filled with spots drained of color. To make a short story shorter, Mario gets a floating paint bucket companion who imbues his hammer with the ability to splash paint and restore color to the world, and the two of them go on a quest to retrieve the Big (and mini) Paint Stars and stop whoever is behind the army of color-slurping Shy Guys (gee, I wonder who it could be). That's the plot, and although the game takes a good 25 hours or more to finish, the story only slightly develops beyond that point for the entire game. 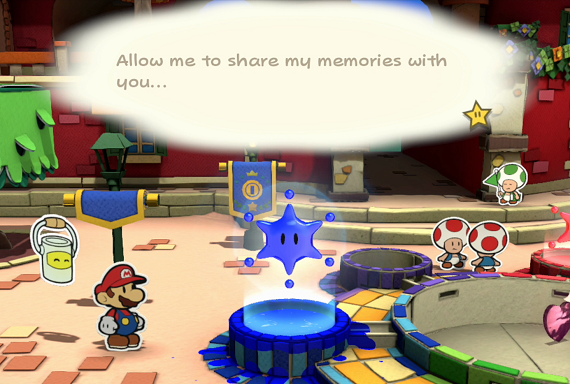 Even though Peach periodically sends letters and the Big Paint Stars show you their memories after you save them, these all end up being just a tease at a plot that could have been, and rarely actually provide any new information. This is where I'd put my plot... IF I HAD ONE! However, while the main story is rather thin, the game's structure of being divided up into many levels on a map screen results in many shorter stories that span one to four areas a piece. They're all just arbitrary objectives that happen to get you to the next Paint Star for one reason or another, but they're also all quite charming and filled with unique characters (well, pretty much they're all Toads, but these Toads have more personality than ever). It also can't be overstated how well done the game's writing is. The English translators did a fantastic job of giving everyone memorable personalities and filling the dialogue to the brim with humor that'll appeal to a variety of players. Not only is the writing laugh-out-loud funny, but there are many situations, puzzles, and animations that serve no other purpose than to add humor to the game. It's the sort of thing that you wouldn't expect the designers to put the time and effort into, but the fact that the setups for humor are more elaborate than usual from a game design standpoint makes them all the more unexpected and amusing. 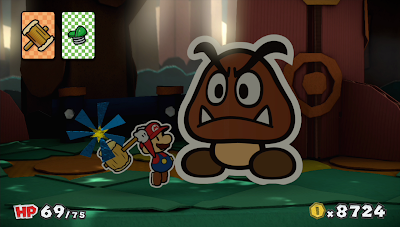 Compared to the first two Paper Mario games, Color Splash's focus lies more in overworld exploration and puzzle solving, than in strategic RPG-style battling (more on battles later). Each of the game's many areas is accessed via an expansive map screen, and new areas are revealed and linked together on the map whenever you acquire a mini Paint Star. 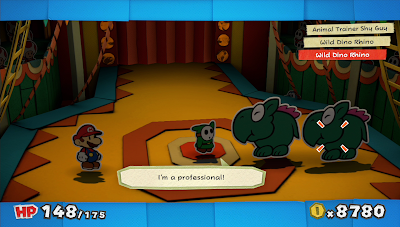 Sometimes getting these Paint Stars is as easy as getting to the end of the level as you would in a typical 2D Mario game, but usually you'll need to solve puzzles, talk to NPCs, and battle enemies along the way. You'll have to use all of the moves at your disposal to progress... but unfortunately, there aren't actually that many moves at your disposal. Mario can jump, hammer, paint with his hammer, and cut out chunks of the background on the GamePad in specific locations. Jumping and hammering are exactly what you'd expect, though there is one variation thanks to "Unfurl Blocks" which, when hammered, start a countdown during which you have to find and hit a marked object to make it unfold into some useful structure. Painting with the hammer can be used to fill in the many colorless spots to reveal coins and extra cards (for battling and/or collecting), and to restore the function of an object (for example, coloring a pipe to make it work or a box to make it destructible - these are usually the only objects you're actually required to paint). For completionists, each level tracks the percentage of colorless spots you've filled in; get 100% on a level, and you'll be rewarded with some music in the museum back in Port Prisma. 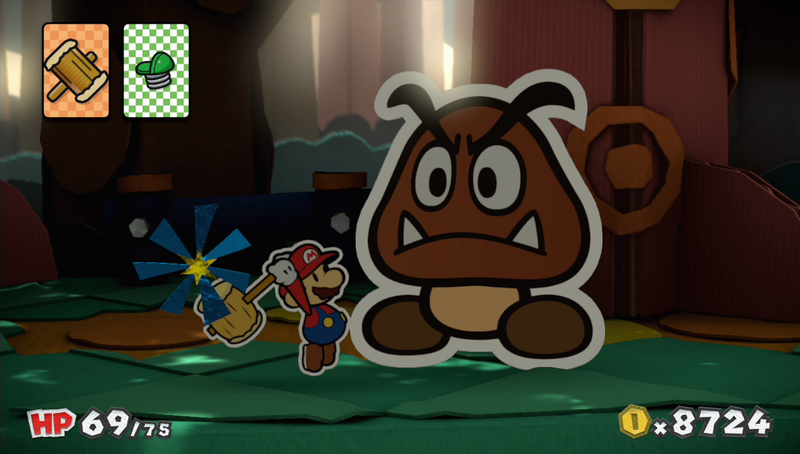 Mario's final ability is cutting stuff out. 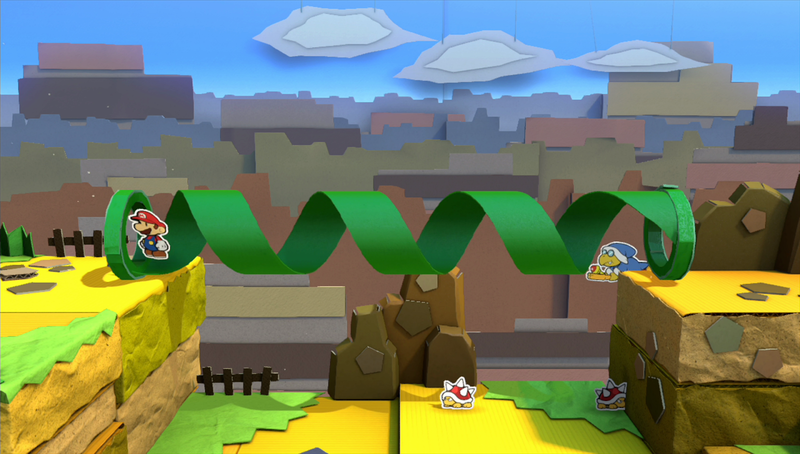 At certain points, the edges of objects and terrain will shift in perspective to make perfect lines, or there may be card-shaped boxes in the background. In these cases, pressing the Y button will reveal a dotted line which matches up with the suspicious spots and transfers the view to the GamePad where you can trace along the line to temporarily cut out that chunk of the scene. Doing so can allow you to place "Thing" cards to solve puzzles or to walk on top of the background to traverse otherwise impossible gaps or climb to unreachable heights. Cut out a chunk of the screen, make stairs. Unfortunately though, these are all of Mario's abilities for the entire game (though there are a couple level specific gameplay variations, such as riding a dragon or pirate ship). 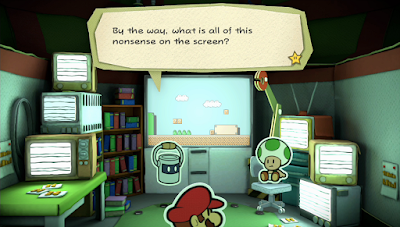 The overworld gameplay is solid and entertaining, but unlike previous games in the series which rewarded Mario with at least one new ability per chapter in the form of a partner or new equipment, in Color Splash, you'll pretty much see all of the gameplay the game has to offer in the first couple hours. The rest of the game, while well designed, merely uses the same simple abilities in different variations. Arguably, this is the game's greatest flaw; you'll master Mario's handful of skills almost immediately and for the rest of the game, nothing new is added to keep the gameplay fresh. Everything is still beautifully colored, filled with fantastic music, artistically built with the paper aesthetic, and designed with some decent puzzles and level design, but by the end of the game it all starts to feel a bit stale, like the same old things over and over, just with a new coat of... uh... paint. 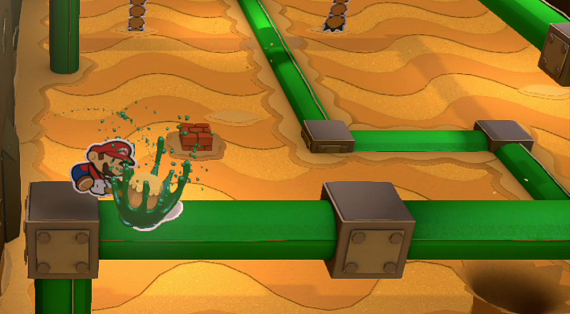 Well, it's later in the game now and we're still painting pipes to activate them. Before moving on to explaining how the battle system works, there are a couple other things worth mentioning about the overworld puzzles in Color Splash. The first of which is "Things". These are rarer, three-dimensional objects which you can squeeze the color from and turn into cards for later use. 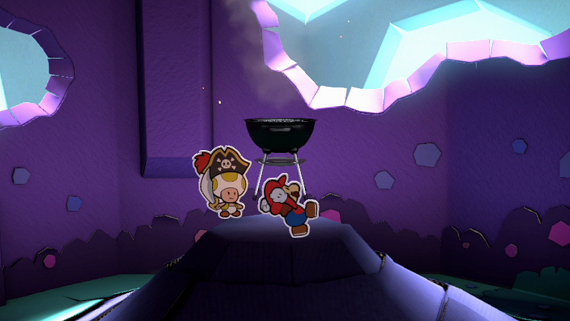 They'll act as cinematic special attacks in battle (and major bosses typically require a specific Thing card to beat) and they can be placed in certain places outside of battle to solve puzzles (using a fan to blow a ship's sails, for example). Unfortunately, placing a Thing card uses it up, so if you make a mistake, you'll have to backtrack to find another. Fortunately, the puzzles which use Things are far more obvious than they were in Sticker Star, Things you've found in the past can be easily bought in Port Prisma, and better yet, there's a Toad nearby the Thing shop who will give very clear hints as to which Things you'll be needing next and which level you can find them in if you missed them somehow. Click to find hot grills in your area! 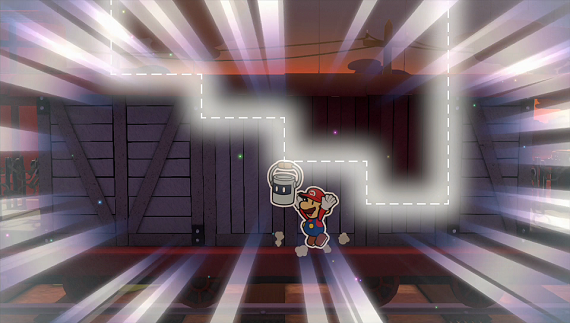 The other thing to mention is that progressing the story in one area sometimes has an effect in another area (for example, a train moving from one level to the next). The most notable recurring form of this is the Toad Rescue Squads, each of which are made up of varying numbers of colored Toads who are scattered across each area and who must be found and told to return to their leader in order to make more progress in their leader's area. Finding them all feels like the sort of thing that might be a side quest, but it turns out that it's required in every case. This could have turned into a nightmare of replaying every area over and over to try to find the Toad you missed, but once again there's a helpful Toad in Port Prisma who will tell you how many lost Toads are in which areas, just in case you miss them on your first time through. The main map also has helpful icons to mark unfinished business in each area, including Toad Squad leaders who are waiting for their team. Overall, what could have turned into a backtracking nightmare is generally not a problem thanks to very clear hints and hard to miss essential Things and Toads.. The combat in Color Splash is fairly unique and different from most RPGs, though very similar to that in Sticker Star. Essentially, every action that Mario can perform in battle is represented as a single use card, and these cards are scattered around everywhere in the world, or can be bought at the shop in Port Prisma. As was the case in every other Mario RPG, each attack has a certain timing-based press of the A button which determines the damage output. Damage output is also determined by the card itself (a large hammer vs. a broken hammer) and by how much paint is applied to the card. You can tell how much damage you've dealt, not by numbered hit points, but by seeing how much paint you've drained from the enemy's body. 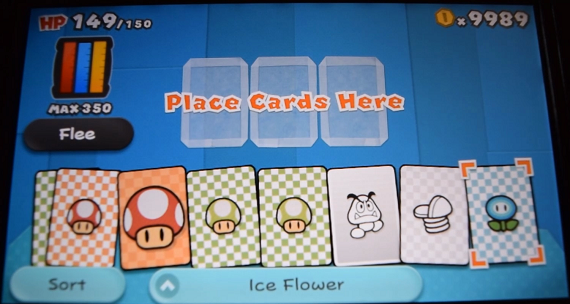 Many cards come fully colored, but others are blank and are far more effective when colored in with Mario's paint supply. Paint is limited, but defeated enemies drop more, as does hitting environmental objects with your hammer, so running out of paint is rarely an issue. Running out of cards, however, can be an issue if you decide to fight every enemy in your path. But Color Splash is not a game that encourages level grinding; the only useful things that defeated enemies drop are hammer tokens which gradually level up your max paint. Since there's little reward for fighting unnecessary enemies, it's more accurate to look at them as environmental hazards which are there to be dodged in order to not waste resources which would be better spent on mandatory battles. You may be tempted to run from unnecessary battles to save cards, but this is a gamble between wasting health and wasting cards, since the success rate for escape is random. It's better to avoid optional fights in the first place - or, later, to hit weaker enemies with a preemptive strike to defeat them in one hit and skip the fight entirely. Though if you do run out of cards, you can either try to escape or pay ten or more coins to get a single extra card per turn. While Mario's battle actions don't vary much over the course of the game, the enemies you'll encounter do vary a fair bit, and are pretty much the only things that keep the battles from becoming a mindless grind. Some enemies come in stacks and are better dealt with by using many weak hits, other enemies have spikes, making jumps ineffective, still others can be flipped over, or have other weaknesses. Since Mario always attacks each enemy in the order that they're lined up, there's a bit of strategy involved in choosing the order of your action cards according to enemy weaknesses and your own ability so that the appropriate card is used on the appropriate enemy. Another thing that keeps the battles at least somewhat fresh, is the seemingly random appearance of Kamek, who will block you from running from the battle and curse you with some kind of gimmick like limiting your cards or flipping them all over. Things come with their own humorous animations when used in battle too. 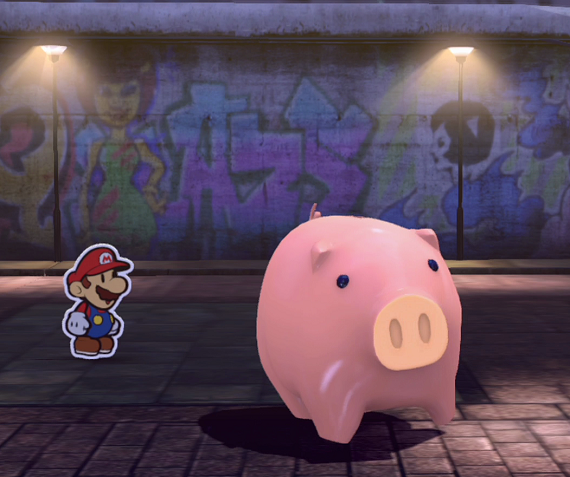 Boss battles were a bit odd in Sticker Star because they were essentially impossible without using the correct Thing. Well, that's back, but only for a handful of battles, and, once again, the Toad in Port Prisma will tell you which Thing you'll be needing ahead of time. The issue then comes with knowing when in the battle to use that Thing card. It's usually obvious and follows the same format in each boss, with a normal battle segment followed by a Thing segment, but if you do use your Thing at the wrong time, it'll be wasted and you'll have no choice but to run from the battle to get another one or reset the game. Furthermore, there are "Replica" Thing cards which can only be used in battles and not for solving puzzles, but for some reason have no effect on bosses even if they're the correct Thing. So that's not very intuitive. The enemy variety helps to keep the battles at least somewhat fresh. There are a few control options to enable buttons to be usable in battle rather than touch controls, though I'm not sure why they aren't just both enabled by default. Secondly, cards are kept in one long line, simulating how Mario holds them like playing cards while deciding his next move. Cards can be manually re-ordered, or instantly sorted by type with the press of a button. It's a minor complaint, but card organization could have been better with the addition of different sorting options and if cards were displayed in multiple rows so that you didn't have to scroll through as many as 99 cards to get to the Thing object you want at the bottom of the stack. 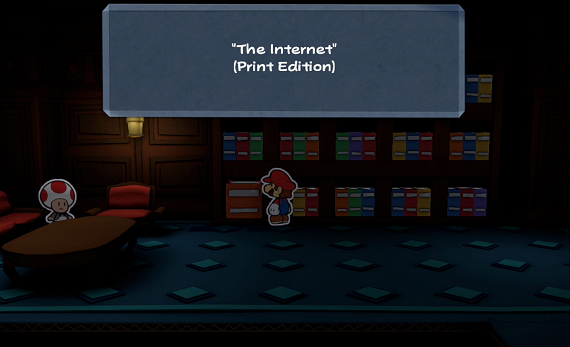 The world of Paper Mario: Color Splash is surprisingly big, and there's a lot to find and do, but almost everything there is to find and do ends up being a required part of the main story at some point. However, there are a few optional goals for the player to pursue. Firstly, there's a museum in Port Prisma that you can donate cards to in order to unlock some pretty spiffy concept art. The museum also contains a sound test room where you can listen to music from each area, which is unlocked for filling in 100% of that area's colorless spots. Secondly, there are Roshambo Temples, where you compete in a series of three Rock-Paper-Scissors battles, using clues and a bit of luck to win tons of easy coins and exclusive cards. Third, there are some hidden cut-out spots with secrets in them which award coins, though finding each of them is tracked. And finally, the main plaza of Port Prisma has some flags with achievement goals written on them. Fulfilling these requirements will unfurl the banners and... seemingly have no effect beyond that (but I haven't gotten them all, so I can't say for sure). ...And that's pretty much every optional side quest in the game. It's not much, but it does mean that the main quest feels extra long thanks to everything else being required. By the way, for those who want to play on the Gamepad only, yes, you can do that and it works just fine. Paper Mario: Color Splash is arguably the most visually and musically beautiful game in the series so far. 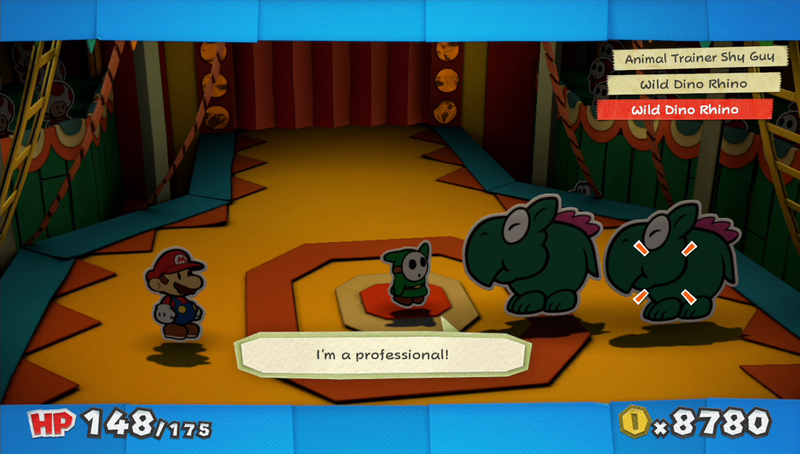 Its main plot may be thinner than usual, but the characters and their smaller, individual stories are put together with hilarious, top notch writing and animation that goes above and beyond the call of duty, giving Toads more personality than ever. I found both overworld and in-battle gameplay to be enjoyable as well, albeit a bit simplistic. However, although everything is great from the start, both the plot and gameplay introduce almost no new innovations for the entire rest of the game, causing it to get a bit stale by the end of the 25 hour adventure. You could say that Color Splash shows its entire hand to the player too early, and that the game's hand consists of only a few very colorful cards. But, complaints aside, Paper Mario: Color Splash is still a rather good game overall, is worth playing, and is something that I think fans of the series and new players alike will enjoy.